There are many options to consider when it comes to refrigerators with ice and water dispensers. Some models offer internal water dispensers in the fresh food compartment to maintain a smooth look on the exterior. External dispensers may dispense water only or water and ice. 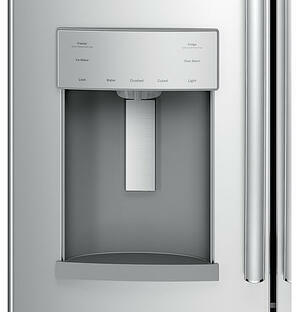 Many of today's refrigerators with these dispensers include filters to improve the taste of the water and ice. If you are considering purchasing a refrigerator with an ice and water dispenser or an ice maker in the freezer, make sure that you have access to a cold water line or are able to install one. If you have an ice maker in your current refrigerator, make sure that the water line is in good condition if you intend to reuse it. If not, arrange to have a new one installed by a licensed professional. Factory installed ice makers are easy to find on any style of refrigerator, and many others come with the option of adding an ice maker at a modest additional cost. From traditional top freezers to single door bottom freezers to side by sides to French door styles, it's easy to find an ice maker. However, if you want a refrigerator with an ice and water dispenser through the door, your options are going to be more limited. Typically only side by side and French door bottom freezers come with this capability, with external dispensers on the left-side door. One of the most common issues with these external dispensers is leaking. If you want a refrigerator with a dispenser but want to reduce the likelihood of leaks, choose a model with a water dispenser only. When you're moving ice from the freezer to a warmer area, it's hard to avoid leaks. You can expect to pay a few hundred dollars more for a refrigerator with a dispenser, but you should consider the costs of the filters over the lifetime of the refrigerator as well. 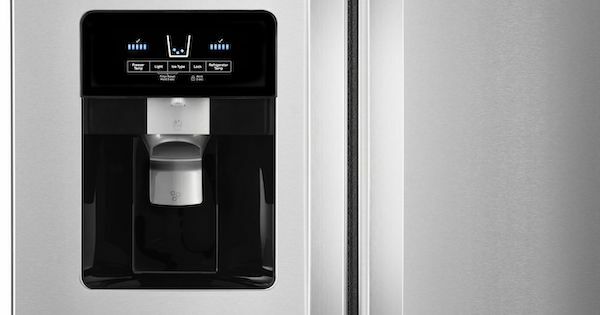 Hot water: Select GE refrigerators come with hot water dispensers and Keurig brewing capabilities - click here to learn more about refrigerators with Keurig built-in! Precision fill: Some brands, like Whirlpool and GE, offer the option to customize the amount dispensed from the refrigerator in ounces, cups, and more. No measuring cups needed! Tall dispensers: LG is a pioneer in this area, offering taller dispensers so you can fill pitchers, water bottles, and other oversized items more easily. Compact ice and water systems: Especially if you're in need of a refrigerator for a smaller space, making sure that any ice maker or dispenser features are compact and easy to work around can be important. 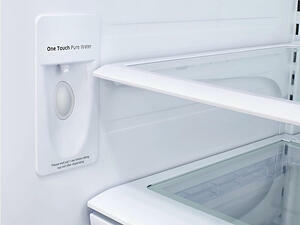 In-door ice is one feature that frees up refrigerator shelving by placing the ice maker and ice storage in the door. How much space is there under the dispenser to fit a container? Some refrigerators feature a control panel over the external dispenser - Does that appeal to you, or would you rather have the controls inside? How do you want the dispenser controls to look? How much do replacement water filters cost? Are you looking for smart features like precision dispense, or do you just want the basics? Do you want ice, water, or both? If there's an ice dispenser, is it an in-the-door ice maker or is it located on a shelf? How does that impact the storage space? We hope you enjoyed this brief discussion of refrigerators with ice and water dispensers. Please leave a comment below. We'd love to hear from you!